Do you need surgery for back and neck pain? Question: Do I need surgery for back and neck pain? Answer: Do I need surgery for back and neck pain? Most people with back and neck pain do not need surgery. What they need is the correct diagnosis and the correct management. A spine expert is usually needed to make a correct diagnosis. For example, those diagnosed with a lumbar disc herniation should do extension or backward bending exercises. On the other hand, if the diagnosis is lumbar stenosis, or crowding of the nerves in the lower back, extension exercises should be avoided. Nonoperative treatment can include activity modification, physical therapy, oral medications and sometimes injections. The vast majority of people with neck and back pain will respond to these conservative approaches. Despite conservative treatment, some people will have progressive nerve damage or progressive severe back pain that may require surgery. In these cases, the types of surgery and the technology available is superior to what was available in the past. My mother needed spine surgery approximately 40 years ago. She told me that after her surgery she remained in bed for six months and was turned with a sheet. For that same type of surgery today, patients are out of bed walking the day after surgery and spend approximately three days in the hospital. 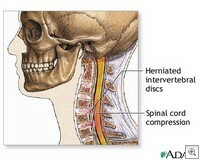 The right diagnosis and the right management is the key to success in treating back and neck problems.